It is easy to think when we read the Bible that there some things that we should take literally and others that we should dismiss as relevant to the culture of Biblical times. We can take verses out of context and search for the Scriptures that will make us feel better or that will allow us to justify our actions. But the verses above simply speak to the importance of knowing the Word and allowing it to permeate every aspect of our lives. The Bible is the inspired word of God- He gave it to us to know Him more and point us to His Son. When He says to write the words on the doorposts of your and on your gates, I like to think He meant it literally. There are so many ways to allow the Word to be a part of our homes. In recent years, I have found that God has given many creatives the desire to use their gifts to bring Scripture to life in a new way. When Rory and I first moved in to our new house, I was so excited to put things on the walls. I love making a house a home. Yes, I wanted there to be pictures of our wedding day and our family and friends, but I also wanted to fill the walls with truth. I don't know about you, but I need to be reminded of truth daily moment by moment. Plus, I have some friends who make some amazing things. 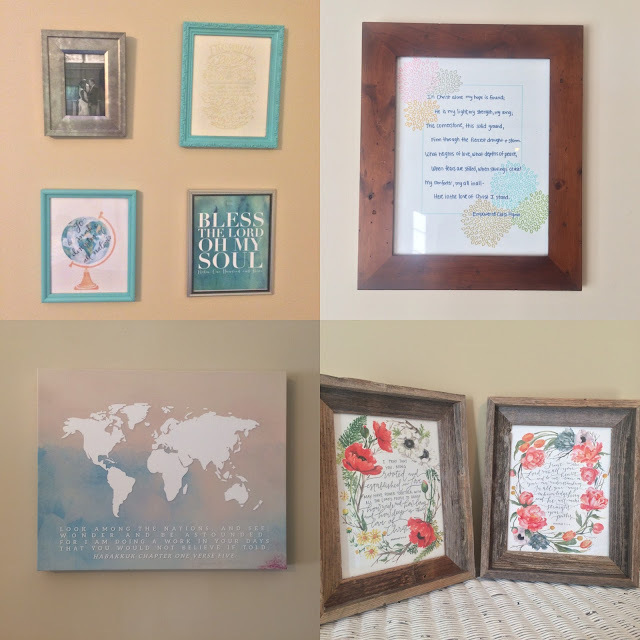 It is an encouragement to look at these beautiful pieces of art and also be reminded of truths that the Father longs for me to embrace wholeheartedly- He is good, faithful, and true. How do you remind yourself of truth? Do you have special pieces of art around your home that point you to Him? Robin that sounds incredible! I love that. I have been thinking up ideas for creating a war room space in our house, and I really like your idea of that simple table that holds all of the essentials. I may just have to copy that!